The Los Angeles City Council voted 13-1 today to hike the city's minimum wage to $15 per hour by 2020. Next, Los Angeles Mayor Eric Garcetti will need to sign the bill, which will raise the minimum wage from $9 an hour to $15 per hour over the next five years. Garcetti has been a big supporter of wage hikes, promoting the hashtag #RaisetheWageLA ahead of Wednesday's vote. "I started this campaign to raise the minimum wage to create broader economic prosperity in our city," Garcetti said in May, "and because the minimum wage should not be a poverty wage in Los Angeles." The minimum wage is already set to increase to $10 per hour across the state of California in 2016.The California State Assembly is also considering another statewide wage hike. A bill that passed the state Senate Monday would bring the rate to $13 per hour by 2017, but it still needs approval from the Assembly. But LA City lawmakers don't want to wait, in fact many council members said the state's proposal didn't go far enough. "I have heard all perspectives on this issue, but the reality is that [some of] our families still have to live in poverty," Councilwoman Nury Martinez (D) said to the council before voting. "What we're talking about doing today is making sure the families of this great city have something to look forward to." But while the lawmakers vote was nearly unanimous, not everyone in Los Angeles will celebrate a wage hike. Several lobbying groups -- including the California Restaurant Association and National Association of Theater Owners as well as small businesses -- wrote letters in opposition to the ordinance. "The restaurant business is widely known for its high rate of failure due to its inability to increase prices to cover rising costs, and for having extremely high operating costs -- particularly labor," a letter from a coalition of LA-area restaurants says. 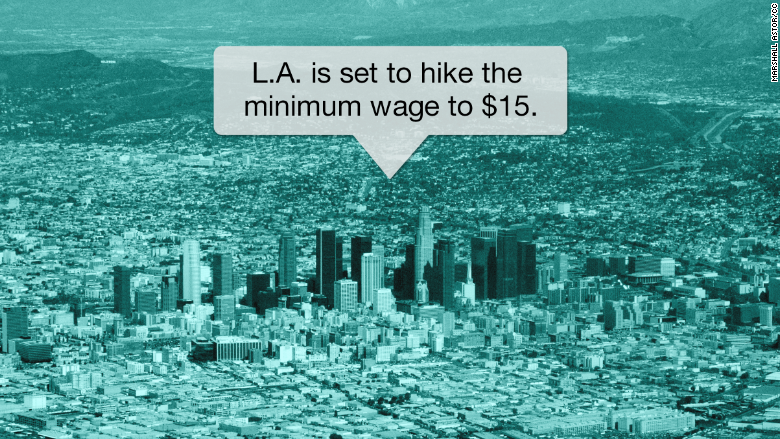 Los Angeles is the latest in a wave of cities to raise its minimum wage beyond what state law dictates. --San Francisco voted last November to increase its minimum wage to $15 per hour by 2018. --San Diego will hike its minimum wage to $11.50 by 2017, a measure it passed last August despite a veto from the city's mayor. --Chicago will bring minimum wage to $13 per hour by 2019, although the Illinois rate is $8.25 per hour. --Seattle will bring its minimum wage to $15 by 2018, which will probably put it ahead of Washington state's wage. It currently stands at $9.47 per hour and is slated for annual increases based on the state's consumer price index.